Oneplus 3 OxygenOS 3.2.6 update is now available for the download. The OxygenOS 3.2.6 update is already rolled out, and many of the users already get the update on their phones. You can see the OTA update on your Phone about settings > System Updates. Oneplus 3 OxygenOS 3.2.6 update is packed with some new improvements and bug fixes like improved Call quality, adaptive brightness performance, camera quality, and lots of optimization. The OTA update is around 40MB. Non-rooted users will get this update via the OTA method, or they can flash the same manually on their phone. If you are the rooted user with TWRP recovery, then you need to flash the Oneplus 3 OxygenOS 3.2.6 Full ROM zip file with the help of TWRP recovery. Here we provide you the OxygenOS 3.2.6 ROM which you can flash on your device. This guide will work for both rooted and non-rooted Oneplus 3 users. 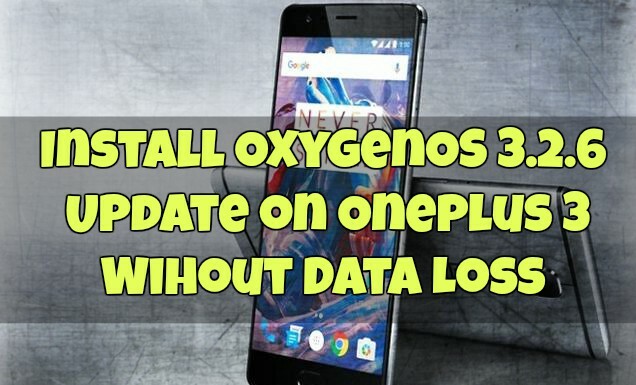 Before flashing the Oneplus 3 OxygenOS 3.2.6 update on your phone do take the full backup of your phone and the guide is only for the OnePlus 3 users and don’t follow this method on nay other Oneplus Android smartphone. So let’s take a look how to download and install OxygenOS 3.2.6 Update on Oneplus 3. Optimized voice calls quality of some IM applications. The below mention guide is for both rooted with TWRP users and Non-rooted with Stock recovery users. All you have to download the Oneplus 3 OxygenOS 3.2.6 Full rom or OTA zip file and flash on your phone. The first method is for the Non-Rooted user with Stock recovery users who are running on the OxygenOS 3.2.4 version. And the Second method is for the Rooted users with TWRP recovery. b) OxygenOS 3.2.6 Full ROM zip file for Rooted users with TWRP recovery. 1. Download the OTA zip file from the above mention links and Enable the USB debugging mode on your phone. 2. To flash the OTA zip file, you need an ADB and Fastboot drivers. Download and install ADB drivers from here and after the installation, you will find the ADB folder on your Windows PC C Drive (C:/ADB). 3. Now copy the OTA zip file in the ADB folder that you created in step 2. 4. Now turn off your phone and boot in recovery mode. Press and Hold Volume Down + Power button to boot into recovery mode. 5. Once your Oneplus 3 in stock Recovery. Select Install from USB/ADB Sideload and Connect the phone to the PC. 6. Now open the ADB folder on your desktop in which you saved the OTA zip file. Press Shift + Right click and open the command window in the ADB Folder. 7. Now enter the following command to check your connection. 9. Now wait until the process complete. Once the process is completed go back to the main menu of recovery and wipe cache and reboot the phone. Now the OTA zip is succeassfull instaled on your OnePlus 3. 1. Make sure that you Oneplus 3 is running on the latest TWRP recovery. 2. Download the OxygenOS 3.2.6 Full ROM zip file from the above mention link. And save the zip file on your phone’s internal memory. 3. Now turn off your phone and boot in recovery mode. Press and Hold Volume Down + Power button to boot into recovery mode. 4. From the TWRP reopcvery Go to Wipe > Advance Wipe > Select Dalvik & Cache & Swipe to Wipe. 5. Go back to the main menu of the TWRP recovery and Go to Install and Select OxygenOS 3.2.6 Rom Zip file. 6. Once the FULL ROM zip file is installed. Go back to the main menu of recovery and Wipe Dalvik & Cache again. 7. Reboot System and Enjoy the 3.2.6 Update. That’s it! Now your OnePlus 3 is running the latest OxygenOS 3.2.6 update. Let us know if you have any questions by comment below. This post is really cool. I have bookmarked it. Do you allow guest posting on your blog ?